Silver Cross recipient, Mike Borlace is considered to be one of the most experienced combat helicopter pilots of recent times. 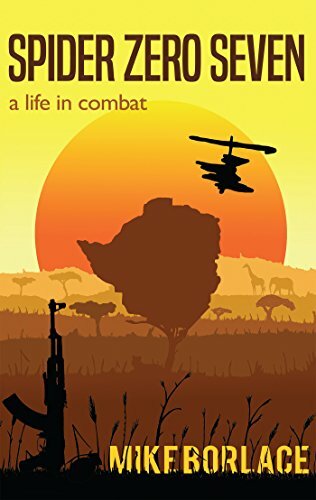 Now he collates his experiences in this compelling wartime memoir set against the backdrop of the civil war fought in Rhodesia during the 1970s. Helicopters were a vital component of the small Rhodesian Defence Force and as part of special forces, Borlace and his fellow aircrew soon became key weapons in the counterinsurgency operations. Adopting new flexible tactics and blending stealth with courage, they carried the fight by air to the heart of the enemy, establishing a fearsome reputation. In this vivid history, Borlace chronicles the story of airmen, soldiers and leading figures such as Joshua Nkomo and Robert Mugabe’s communist backed guerillas from the perspective of a professional officer at the sharp end. In Spider Zero Seven, Borlace humorously recounts the training, living conditions and hardships of his time in the forces. He also touchingly depicts the human side of the military through his portrayals of his fellow pilots, technicians, medics, nurses and flying with his dog Doris. Out of the 1096 days he served as a pilot in 7 Squadron, Borlace spent 739 days on combat operations. During his 149 contacts with the enemy he was shot down five times and wounded twice. He is one of only five recipients of the Silver Cross, the highest gallantry award given by the air force. With this authority he gives a powerful insight into the violent events of a brutal conflict, in a book that will appeal not only to those interested in military history, but also to a wider readership who enjoy a personal, true-life adventure.